Have you seen them yet? Plump and silvery green with prickly scales and furry centers; they’re in season right now. Big, beautiful springtime artichokes are here. 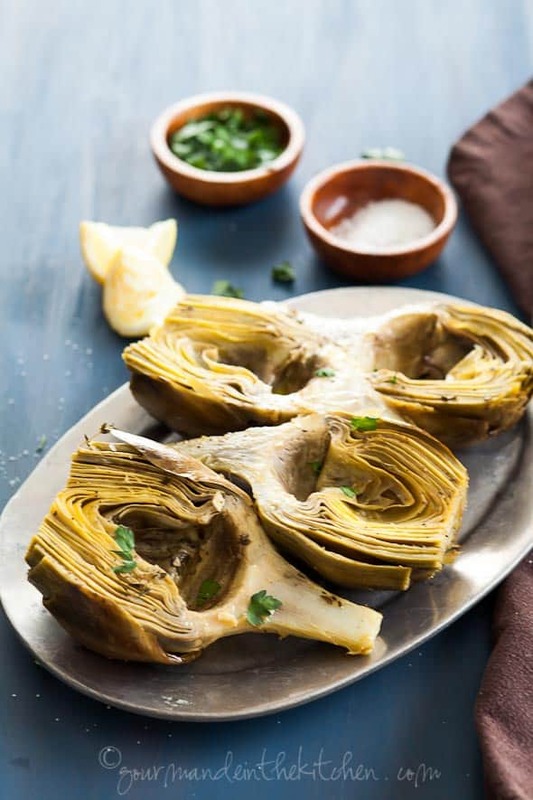 I’ve certainly eaten my fair share of artichokes over the years and I savor every delicious moment they are in season during the spring months and again for a shorter time in the fall. Don’t let yourself be intimidated, although they may be a bit tricky to prepare, they are well worth the effort. Once you’ve tamed their prickly thorns and fuzzy chokes this edible bulb offers a delicate taste, sweet and mellow that can’t be matched. Eating an artichoke is a hands-on experience. Peeling back each delicate petal with your fingers and dragging it gently between your teeth to remove the soft fleshy bit forces you to slow down and appreciate every delicious bite, until you finally reach the best part: the tender heart. 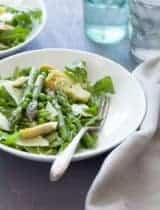 My usual preparation is generally to steam them whole and enjoy them with a vinaigrette, but when I want to dress them up, I head for the oven. 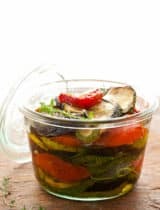 No exotic ingredients, unusual spices or complicated cooking methods, just a gentle braise that results in an ambrosial fragrance that will invade your kitchen. After stripping off the tough outer leaves, snipping off the thorns, and removing the inner choke, I toss the artichokes in a mixture of lemon juice, olive oil and white wine flavored with garlic and thyme and seasoned with sea salt and ground pepper. The garlic and thyme gently infuse the braising liquid with a subtle, elusive flavor. 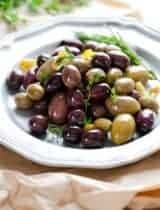 Serve them either warm or chilled with an extra squeeze of lemon juice and a shower of fresh parsley, linger and enjoy. Gently braised artichokes in a garlic and thyme infused marinade. In a large roasting pan, combine all the ingredients except the artichokes. Pull off and discard the thick outer leaves of the artichokes by bending them back and pulling them down toward the stem (Remove leaves that are dark green, but do not remove leaves that are green at the top and yellow on the bottom). 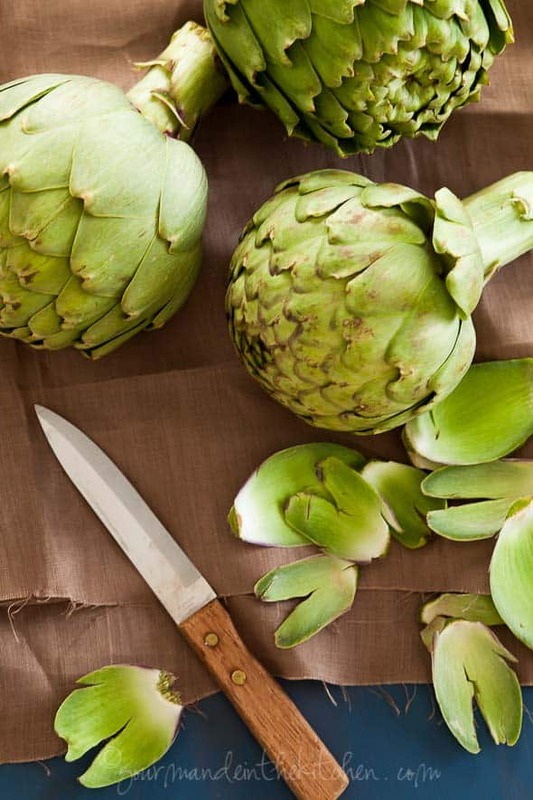 Snip off the tops of the leaves (at the point where the green and yellow come together) and trim around the base of the artichoke heart to smooth the sides and peel the stem. Cut in half and scoop out the fuzzy choke with a small spoon. As each artichoke heart half is completed, add to the pan with the braising liquid, turning them to coat completely and prevent browning. Cover the pan with a lid or parchment lined aluminum foil and cook until the hearts are tender when pierced with a knife, 30 to 40 minutes. Remove the pan from the oven, uncover, and let the artichokes cool in the braising liquid. Garnish with a chopped parsley, serve warm, or refrigerate and serve chilled. How do you like to eat artichokes? Sounds like such a simple & elegant dish that's packed with flavour... I haven't tried my hand at making artichokes at home yet (yes, I'm a little intimidated by them! ), but hope to try soon! Don't be intimidated, they are easier than they look to prepare. I had a big, fresh, awesome artichoke in my hands at the groc store on Wed and put it back because I am so horrible at preparing them...wish I would have gotten it b/c now I really want an artichoke! I adore artichokes, they minty-lemony-woodsy aroma. 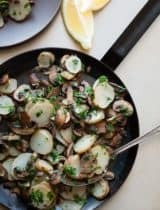 I do mine simply as well, close to this recipe, using garlic and parsley. The baby ones are particularly fun to serve as a side dish. I love artichokes in just about everything! My favorite is grilled with a garlic aioli but yours sounds so good it could definitely rival it. Ooo, the garlic aioli sounds delicious! Oh Sylvie, My whole family adores artichokes. This sounds like a wonderful way to infuse a little extra flavor. I have to say I've always been a bit intimidated by artichokes. 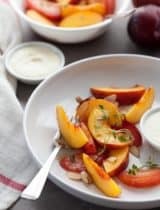 This recipe sounds amazing and as always, your photography makes me drool. I just bought artichokes and I have that exact same silver bowl! It's like I was meant to make this recipe. Like many above I have not cooked artichokes at home. But I'm tempted too! 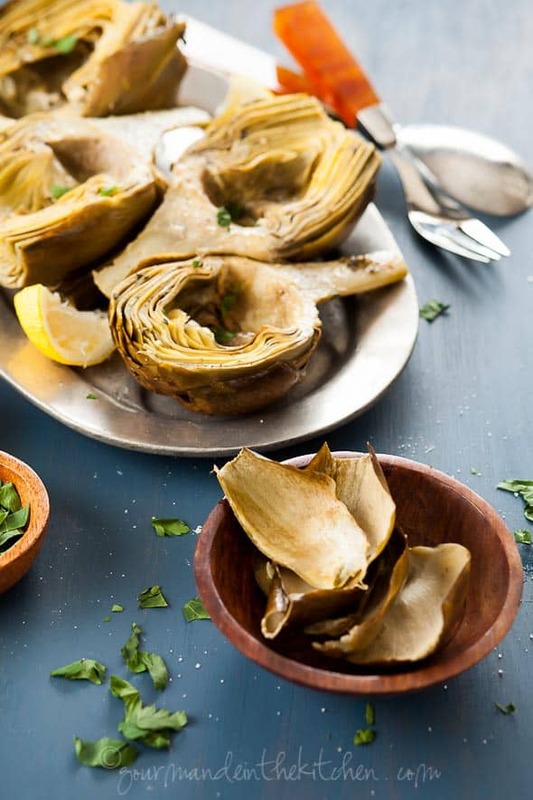 artichokes are totally scary, but this makes them look easy and COMPLETELY delicious! My family adores artichokes. These look so lovely. I can just imagine how they taste. Hi Sylvie! What a wonderful dish! I wish artichokes were in season here too, I didnt have any in years. Realy I am missing out. I ll save your recipe for later because I need to try them out with lemon and thyme. thanks for sharing and I wish u a happy Easter! Thank you Helene and Happy Easter to you as well! Simply beautiful, Sylvie. I've never made artichokes at home like that. I'd like to try. Unfortunately for some reason the artichokes here never look that good. Maybe I'll get lucky this spring and find some decent ones to try our your delicious recipe. so lovely Sylvie! Have a wonderful weekend! Well that's the healthiest pregnancy craving I've heard! Oh yes, artichoke dip is a favorite of mine as well! Artichokes and I have a somewhat troubled past, but recently I was able to make peace and now we're getting along smashingly. I love the stems, I'm so happy you kept them on! 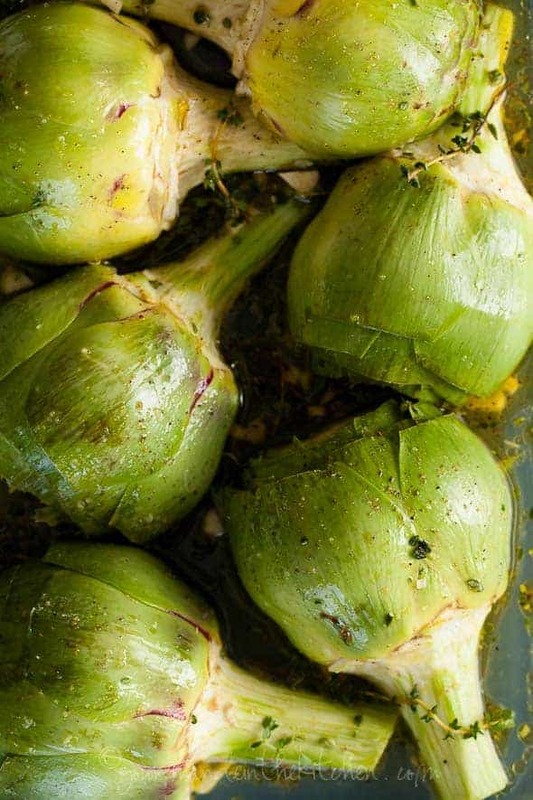 These artichokes sound fabulous; I love any vegetables paired with garlic and thyme. It's a great combination isn't it? The smell coming from the oven when I make this is heavenly! Okay Sylvie, Now you've done it...I have such a hankering for an artichoke! I love to eat them just the way you described, usually dipped in melted butter. I want to try your way...sounds so flavorful and more healthy too! Your second-to-last photo is my favorite. I love them steamed with melted butter as well! I have to say artichoke is something I love but I have never really cooked at home... May be once with my friends but lets just say never.... Your recipe is totally telling me to go and buy and cook these babies... Tmrw is farmers market day for me, I will be on lookout for some good artichoke; now that I have a recipe to tackle them.. B/W gorgeous pictures!!! Do you sell your prints/pics? They are absolutely breathtaking good!! Hope you find those artichokes at the market! And thank you for the nice compliment, yes I do sell prints. Thanks Sylvie for your reply, Now I have to start picking the one I want for my home.. Your pictures are really Gorgeous!!! Yumm.... Artichokes are rarely available where I live so I haven't cooked them at home yet but they look so beautiful! I love the arrivial of artichokes - delicious fried, roasted, or even shaved super thin and raw in a salad. Yours look gorgeous and your photos are stunning, as always. I have been making artichokes for a 1,000 years and have never removed the outer leaves (just snipped the top and stem). Duh!! 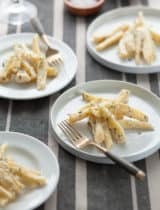 I am making these this week - they are right up my alley and so in line with how I want to eat right now! Thanks for inspiring, Sylvie! Love artichokes. I never braised them in the oven. You are lucky you live in CA they get to you there in Southern CA fresher than on the East Coast. 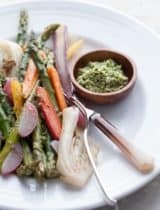 Love such simple healthy and scrumptious ways to enjoy my veggies..this one is just what I would love on a weekend. I grew up on artichokes... always a staple in our household (funny seeing that I know so few people who had the same experience). Can't wait to give this beautiful recipe a try. Just need to get my hands on them! Beautiful artichokes, Sylvie! I've never cooked them whole myself, but your beautiful photos inspire me to give it a try. I recently picked up some globe artichokes at the farmers' market and have one remaining. Will have to give this a try, they look lovely! I need to cook with Artichokes more..your recipe with garlic & thyme looks superb! Tricky AND prickly for sure, Sylvie! But oh so worth it! Love your recipe. What could be tastier? I'm looking forward to visiting relatives in Portland soon. My stepmother always fixes wonderful artichokes for us. I'm going to book mark this and give it another go...I do always seem to mess them up. That smell gets me every time, so good! I hope you enjoy them. Nice idea! I never would've thought to braise artichokes. In fact, when it comes to cooking artichokes, I'm quite the amateur. These look delicious. These look really great. When it comes to cooking artichokes, I'm quite the amateur. This recipe looks delicious and approachable. Oh my word! I love artichoke. We have artichoke plants in our back yard! I must try this recipe. You are gifted photographer! Love all your photos. 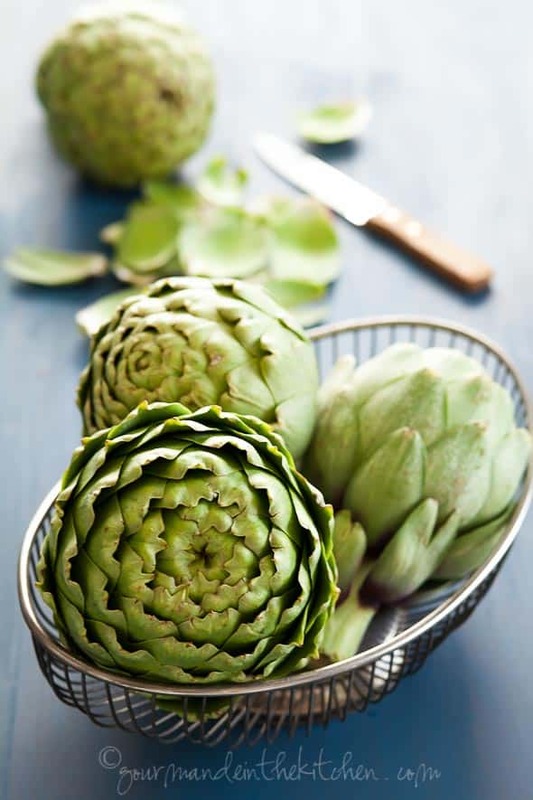 What a gorgeous way to serve artichokes Sylvie. I was always scared of preparing them at home, until recently, and found they really aren't difficult to deal with at all. They are also beautiful too! This recipe must be given a try cause it sounds phenomenal. I love artichokes! I haven't ever braised them, I usually steam them, but I am SO going to try this! 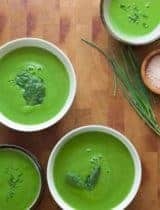 I knew I just had to make this recipe when I came across it. It made the perfect addition to my Easter dinner! The lemon and white wine pair so well with the artichoke and the braising made my kitchen smell amazing. These look absolutely delicious Sylvie! You are very very lucky to live in CA, if at least for the produce! I made these over the weekend and they are fan-f'n-tastic!!! You are a genius! I hope you enjoy the recipe, it's really not much more work than traditional methods, just a matter of chopping them in half before cooking them in the marinade. erp--not roasted. What's wrong with me today? Braised, not roasted! You scrape the bottom portion of the leaf with your teeth to remove the edible part and discard the rest of it. As you get closer to the heart the leaves get more tender and you can nibble up higher but the very best part in my opinion is the heart which once you remove the fuzzy choke is entirely edible and my favorite part!